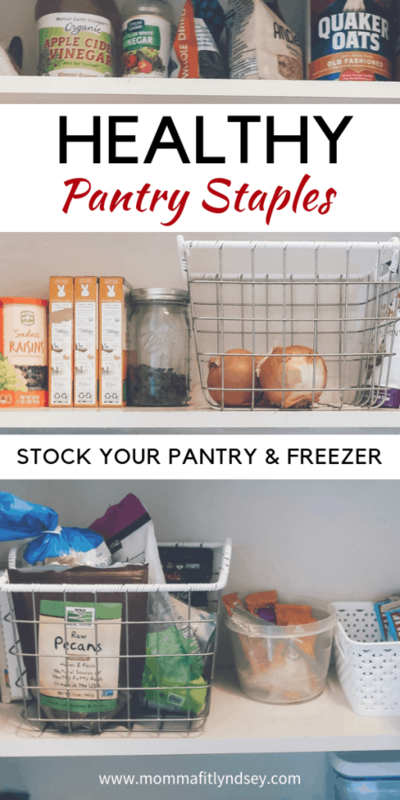 If you are looking to have more healthy food on hand, starting with a healthy food list for your pantry and freezer is a great place to begin! When you have healthy food on hand at home in your pantry and freezer, it will become a lot easier to make healthy choices. This list includes everything that I deem essential for my own healthy pantry. The list is not meant to exhaust all options, nor does it adhere to any “diet”. Instead it focuses on mostly whole, real food items and food items that have more nutritious ingredients. I’ve found that by having these items on hand it makes it easier to make healthy food at home for less money! I also wanted this list to be budget friendly. The worst thing you can do is to pack your pantry full of expensive ingredients that you may not use. I tend to err on the side of less is more and challenge myself to use what I have. How do I Keep My Pantry Organized? 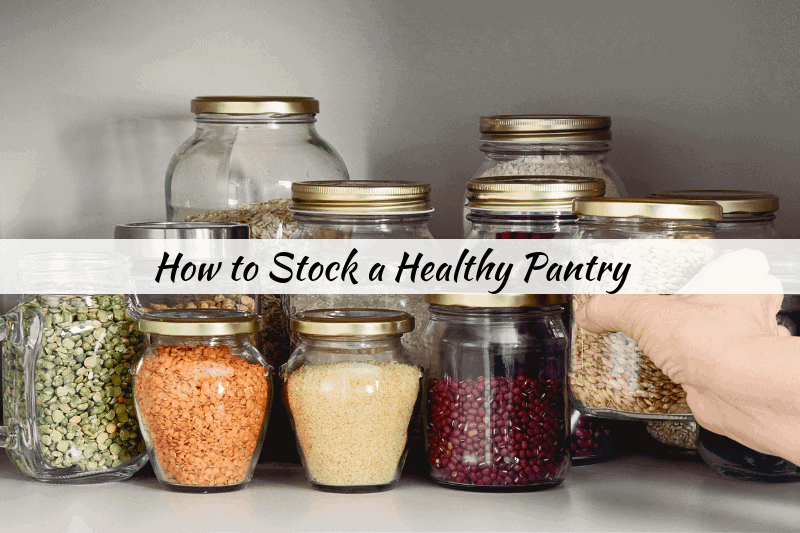 Once you have your pantry organized you can begin to stock up with healthy food. This is the list of everything I have on hand at all times. Between my pantry and my freezer, I should always be able to create at least five healthy dinners. Keep reading for a few meal ideas with your healthy pantry items! Taking inventory and recording what you have on hand will be the first step in stocking your pantry. Record what is on hand for your pantry, freezer, and fridge. If it’s been awhile since you cleaned these areas out, you may find that you have full meals already available! 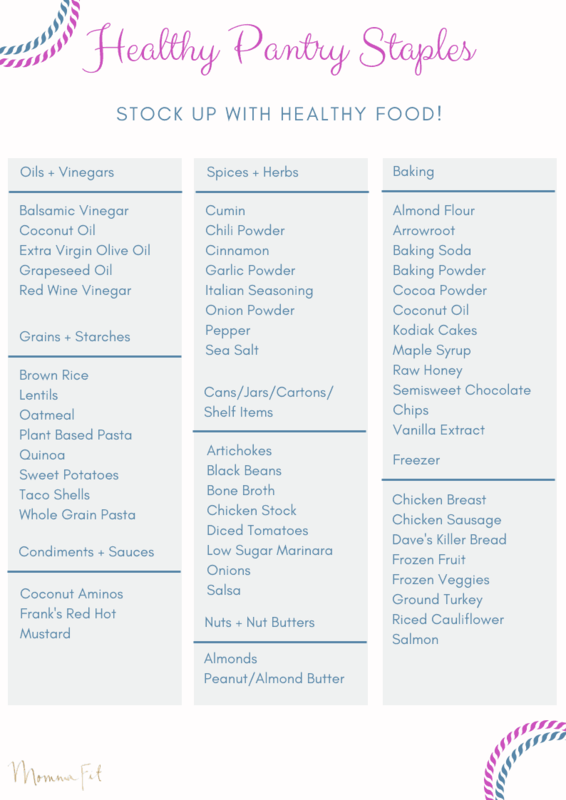 Comparing what you have on hand to the pantry items in the list above, you may be surprised at how much you have on hand that is healthy! Sometimes it’s about making simple swaps (i.e. whole grain pasta for white pasta) that will help to improve your nutrition. One thing I wouldn’t recommend its throwing any food away. Unless it’s junk food and you don’t want it in your house, I would recommend using up what you have on hand! Then, next time you are shopping you can make a few simple swaps to stock your pantry with healthier food. This recipe uses my favorite plant-based pasta, Banza! You can add in some chicken sausage, diced tomatoes & some spices and it makes a quick and easy dinner. Sheet pan nachos are a family favorite because we eat right from the pan! 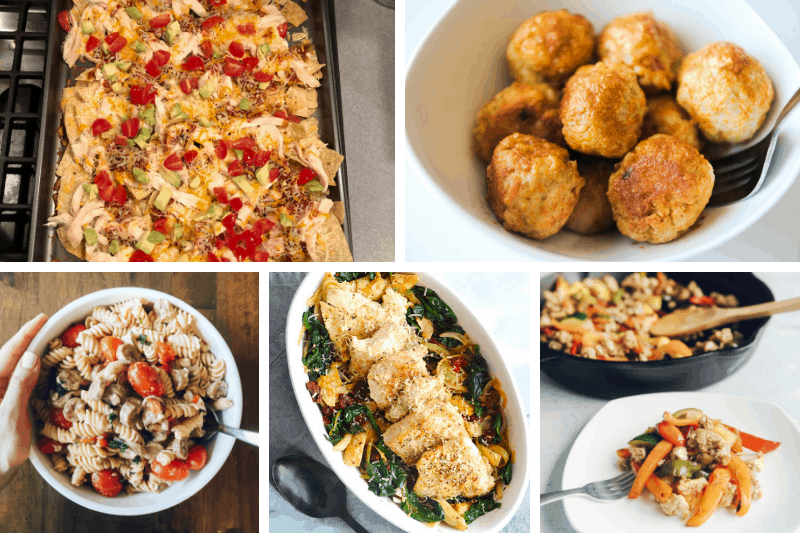 Using tortillas or tortilla chips from the pantry and frozen chicken I can whip these up in no time during the week. I like to add in fresh tomatoes, cheese and some avocado. Simple and straight from the freezer! A family favorite that you can use with any canned or frozen veggie you have on hand. These meatballs are delicious and easily adaptable to be made with marinara sauce. Alright friends tell me! What is your biggest struggle when it comes to eating healthy? Tell me about it in the comments!